Raspberry Pi enthusiasts that are looking for a compact computer system that will allow you to program and use your Raspberry Pi 2 single board mini PC almost anywhere. Might be worth giving a new solution called DragonFruit more investigation. 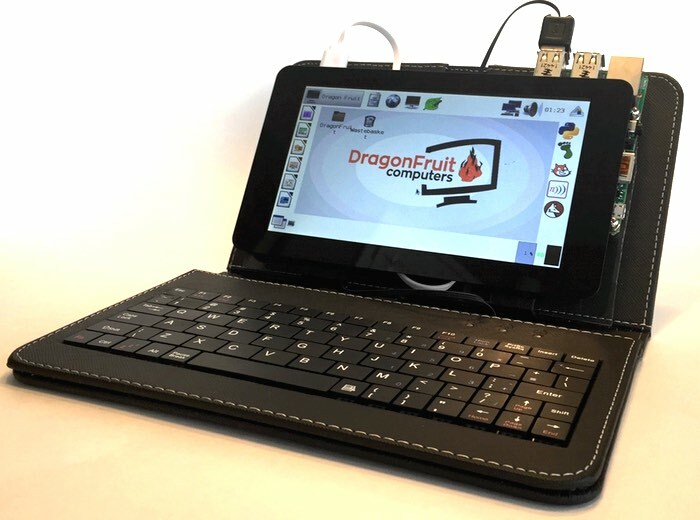 DragonFruit is a complete Raspberry Pi 2 portable system that has been designed by a 13-year-old to help learn more about programming and computers in general and offers a compact all-in-one system that is compatible with the official 7″ Raspberry Pi touchscreen. As you can see from the image above it also includes a keyboard, case and rechargeable battery and a number of different pledges are available depending on the hardware you may already own such as a Raspberry Pi 2 mini PC and even the 7 inch Raspberry Pi touchscreen. Its designer explain more about the systems features and the DragonFruit operating system. DragonFruit is a complete and compact computing solution based on the Raspberry Pi 2. It solves the problem of a messy and complicated set-up by combining everything into a small and portable case. It includes everything you need to get started with the Raspberry Pi 2. We’ve also modified the Rasbian operating system to create DragonFruit OS. It’s been modified to make it easier to use with a touch screen. We’ve included a couple simple tutorials to get users started programming with Python and Arduino. The system can be easily taken apart with just a screwdriver for modification, upgrades, or just to explore. For more information on the new DragonFruit jump over to the Kickstarter website for details via the link below and make a pledge from $140.